For most of us, the pull of home is strong, even if we’ve traveled abroad or settled far from our birthplace. We often run across that essential truth when we interview homeowners and learn what attracted them to a particular house in a specific place. The homeowners who invited us into their homes for this issue share that same affinity for their roots. After Harry Goetzmann completed his military tour of duty, he and his wife, Sylvia, started looking for a permanent home in which to raise their family. They didn’t return to any of the towns where Harry had been posted, instead focusing their search in New York State, where both had grown up. They split the difference in distance between Amherst, a suburb of Buffalo where Harry grew up, and Albany, where Sylvia was raised, to settle along Skaneateles Lake, one of the Finger Lakes in central New York not far from Syracuse, where they met in college. There they bought a home old enough to suit their collection of late-1700s and early-1800s antiques and modern enough to accommodate a family of five children. Joseph Miller left home for college then toured Europe for a time, but family and familiarity tugged him back to Petersburg, Virginia. “I was born here,” he said simply. And so he returned to follow the family tradition of revitalizing the town by restoring its historic properties. His efforts to reunite the three separately modernized sections of the mansion called Strawberry Hill earned him a National Preservation Award. Though not born there, I give Pennsylvania pride of place among the states as the birthplace of many in my extended family, including my parents, my husband, and our daughter. It’s also home to America’s system of government, and the site where immigrants we call the Pennsylvania Dutch developed or adapted many of their cultural traditions and shared them with America at large. We examine two of those traditions in this issue. If you like pottery—and who among us doesn’t have a shelf or two of crockery or fine china on display somewhere in our home?—we give you a glimpse of earthenware pieces that haven’t been found in any scholarly text or museum catalogue. In March, Landis Valley Village & Farm Museum opened its gallery doors to Thrown, Fired, and Glazed: The Redware Tradition from Pennsylvania and Beyond. The exhibition showcases some of the finest redware known—and unknown. Many of the pieces, first discovered by dealers and collectors in the early 20th Century, often were tucked away solely for their owners’ enjoyment. The exhibition is so vast it will remain on view for two years to give visitors a chance to see the approximately 400 pieces curators Jennifer Royer and John Kolar assembled, half this year and the other half next year. Those colorful, industrious Pennsylvania Dutch gave us something even more practical than everyday tableware when they crafted a wagon that could carry tons of goods across the Appalachian Mountains. The Conestoga wagon, distinctive for its gracefully curved body, pulled by a sturdy team of six horses, helped open up the Ohio Valley and beyond for settlement, transporting raw and finished goods back and forth across the mountains. 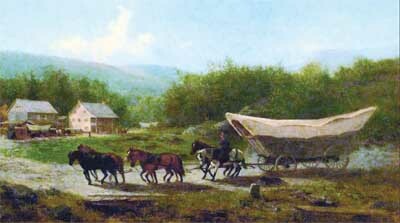 With the wagons and their constant presence along rudimentary roads in the first half of the 19th Century came other traditions, many accepted, some possibly apocryphal. In either case, the Conestoga wagon and its drivers earned their place in our early history. Click here to post a comment about this letter.